BMH Books of Winona Lake, Indiana, has just released new versions of two highly-acclaimed books on prophecy by the late pastor and Bible teacher Lehman Strauss. In The Prophecies of Daniel, Strauss has written an engaging and informative commentary quite applicable in this day when there is great curiosity about future events and what the Bible says about them. Both these books will be helpful either to the preaching pastor or to the serious lay Bible student who wishes a better understanding of biblical prophecy. Lehman Strauss, Litt.D., F.R.G.S., taught Old Testament history for eight years at Philadelphia Bible Institute and served as pastor of the Calvary Baptist Church in Bristol, Pennsylvania, from 1939 to 1957. He was pastor of Highland Park Baptist Church in Highland Park, Michigan, until the end of 1963 when he resigned to devote full-time to an itinerant Bible conference and evangelistic ministry. Dr. Strauss was residing in Florida and was writing his 19th book at age 86 when the Lord called him home in June of 1997. Both books retail for $17.99. 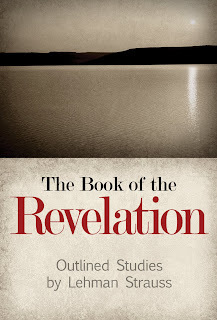 The ISBN for The Book of the Revelation is 978-0-88469-090-0 and the ISBN for The Prophecies of Daniel is 978-0-88469-089-4. Both are available in paperback at www.bmhbooks.com or by calling (toll-free) 1-800-348-2756.